Shuck and Jive: Happy Candlemas! 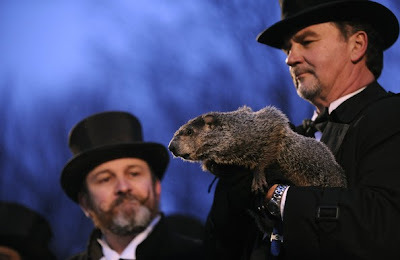 Punxsutawney Phil, the most famous groundhog ever, emerged from his tree stump burrow in Punxsutawney, PA, Tuesday only to find his shadow and six more weeks of winter. A friend of mine eats groundhog. He recommends cooking it in longs of tomato sauce to moderate the flavor. Or course he also eats skunk! How far are you away from Punxsa whatever? Ever been to one of those events? When my lovely and I were both djs in Boise, ID, we worked at different stations. She did mornings and I did afternoons. February 2nd that year was a Saturday so we were on at the same time. We were on the phone sharing tidbits and I told her about the Punxstawny Phil thing. Except I added that if he does see his shadow they cook him and eat him. Bless her heart. She thought I was telling the truth and told her radio audience the news. Is that Bill Murray holding Punxsa? I have a couple of recipes for Groundhog (called "Whistle Pigs" by the old timers in Appalachia), if anyone wants them. Doc Watson also recorded a great old song about catching and eating 'em. Because they forage mostly on forest mast that consists of hickory nuts, pine seeds, etc., they have a rich, nutty flavor to them. Their hides, according to Doc, make the best shoelaces, also. That is what I thought too! Intentional look-a-like? Punxsa is closer to Pittsburgh. My friend who eats everything is from WVA and calls them whistle pigs too. Maybe he and snad ought to exchange recipes. They are the quickest things when you are hunting them. They stand up next to the hole and when you try and aim at them they are back down the hole.